“Where to start … Well I’m already considering returning in the future. The people here are so welcoming. You are guaranteed to have a great laugh with the children and staff. There are hugs galore and the children really do touch your heart. 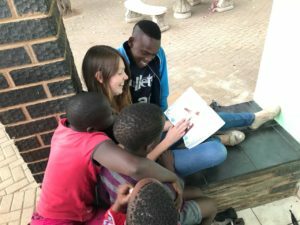 They are so happy to have volunteers to play with and teach them new games, I have learnt a lot from the children and working as a team at Holy Family Centre. The winter camp was great fun. 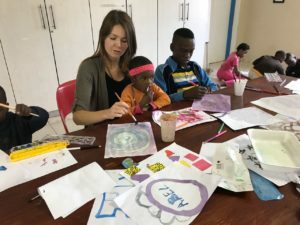 The children loved baking, crafts, and having someone to run get out and play with. Time flies, as everyday there is a new adventure to be had. 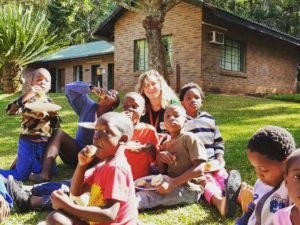 The Holy Family Centre is situated in a stunning, rural location, surrounded by the spectacular Drakensburg Mountains. There is a great atmosphere in the local town. The support from Fr. Alan and Sr. Susan in the MSC Volunteering Programme was fantastic from start to finish. Sr. Sally, the director of Holy Family, works tirelessly to keep everything running smoothly has offered endless support throughout our time here. 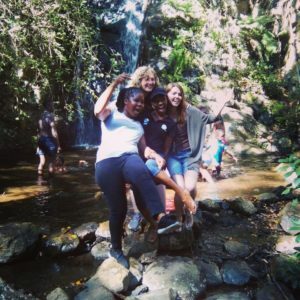 “This experience has exceeded all of my expectations. The relationships made and the experiences shared will be memories I will cherish for life. The Holy Family Centre team are just that one big happy family, who have been so welcoming and friendly. All of the staff and Sr Sally have been so accommodating and have looked after us and supported us so well. I am enjoying working and playing with the children. From baking to knitting, and of course playing soccer, all of these experiences and many more have been wonderful. The children love to include us in all they do. This was very evident during the winter camps with the children proudly showcasing and displaying all of their skills and flair. Now that the kids have gone back to school we have started to help them with their studies. The kids seem to appreciate all of the help and support we give.